You are here: Home » MEDIA » Comics » Comic Book Creator #18 Summer 2018 (magazine review). Comic Book Creator #18 Summer 2018 (magazine review). The latest copy of ‘Comic Book Creator’ starts in several parts. That is some of the interviews are spread over more than one issue. That in itself is no big thing because if you did a page count, they’d fill each issue. For starters, we have part 1 of an interview with Mary F. Fleener as she discusses her life growing up and how she played bass guitar in a band and working in the alternate comics. Even though I’ve never heard of the lady, her insight into American life over the decades has added to my understanding of the culture. One thing that will guarantee sales is an issue with Neal Adams in it. This time, he discusses his work on Tarzan and his ‘Jungle Man’ portfolios with Gary Buckingham and there’s a jaw-dropping amount of artwork here to admire. I think I have one hidden away in my various collections. There’s a brief interview by Darren Patrick with Mike ‘Badger’ Baron which looks like the warm-up for the Steve Rude interview. Before that, though, we have the second part of an interview with the late Rich Buckler about his creation of a certain cyborg called Deathlok. At least, that was how it started before getting some insight into Marvel practices of the 1970s. Treat this as required reading. 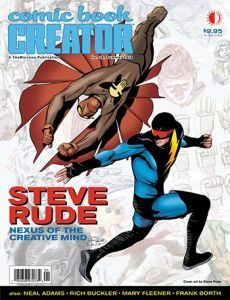 Steve Rude is someone I’ve heard of but never pursued, even when he was doing ‘Nexus’. I think I was collecting too many comics at the time and couldn’t afford to get embroiled in another reality. For this extensive interview which fills the rest of this issue, he invites Jon B. Cooke and Steve C. Ringgenberg to his ranch and share his life for a day. One thing you need to start with is a scorecard or a good memory to keep track of the different names he calls everything dear to him. Oh, these keeping changing as well. Don’t expect to see wall-to-wall Rude pictures here. There are a lot, including some nice paintings, but also his influences as well. Apart from Kirby, there’s a variety of newspaper strips and Andrew Loomis. As we’re of a similar age, I suspect we wouldn’t be short of something to talk about. I see the Loomis influence in a couple of Rude’s paintings here. You do get a lot of insight into what motivates Rude and I suspect in any earlier age would be seen as a Bohemian in his outlook. There is a lot to be learnt in terms of practices in never stop learning and acquiring a wide range of tastes and never to stop drawing. I have to confess that I’m less sure about the differentiation from cartoonists but I have turned my hand to all forms of illustration over the years and each has its own complexity. This has to be longest interview I’ve read in ‘Comic Book Creator’ but to cut anything would have missed things. By the way, editor Jon B. Cooke is looking for letters for his column so if you buy this issue, be sure to write him with something constructive to say. « Murders In The Zoo (1933) (a film retrospective by Mark R. Leeper).